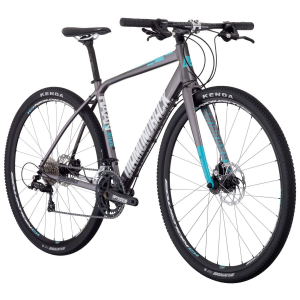 Redefining where and what a "go-anywhere" bike can really go and do, the versatile Diamondback Hannjenn Complete Bike proves its mettle as a trustworthy commuter, gravel, or XC bike every time you saddle up. Budget-friendly and performance-driven, the Hnjenn is built with a solid aluminum frame and Shimano's ever-improving Sora drivetrain. As with its brother bike, the Hnjo, Diamondback focuses on creating a bike that would adapt to a wide range of terrain, allowing riders to indulge their mid-ride impulses and veer off the pavement in favor of dirt to momentarily check out a new area or trail they hadn't noticed before. In order to do this, Diamondback brought in treated 6061-T6 aluminum to ensure the frame itself achieves the ideal blend of durability, stiffness, and low weight. Then, DB shaped that frame with an endurance geometry--think longer wheelbase, higher stack height, and shorter reach. A geometry that's popularity has skyrocketed recently for obvious reasons; when paired with less aggressive, flat handlebars, the endurance geometry of the Hnjenn achieves a comfortable riding posture and intuitive handling without any of that twitchy jitteriness you'd normally find in a race frame. From winding canyon roads to rolling bike paths, Shimano's two-by, nine-speed Sora drivetrain does what you ask of it without hesistation, enabling you to enjoy your ride without worrying about mechanical malfunction. Like all Shimano groupsets, Sora has received trickle-down technology from its flashier siblings, and it's only becoming smoother and easier to operate with time. Tektro Lyra mechanical disc brakes provide you with reliable stopping power whether you're pedaling through wet mud or down steep grades on smooth roads, and the Hnjenn's alloy rims come wrapped in the Kenda Flintridge tires that handle slippery, loose gravel, mud, and rain-slicked city streets with aplomb.